It had been tense couple of weeks in the Cove, drama stirred up from the former Hyaline member. Once a prisoner who grew comfortable with his captors. He successfully claimed Pangea, and Clayton wanted to know why. He was a calm man, and it was possible the pale stallion wanted Pangea to be closer to his children...and Kensa. It was all so possible that he also wanted to bring harm to the eastern sector. Clayton draws himself to the border of Pangea, the one territory he was not familiar with. It was to his knowledge that the bridge between Litotes and Kagerus burned when he was taken captive, but new rulers mean new relationships. The bay horn stag allowed a whinny to echo across the desolate Pangea, patiently awaiting Litotes arrival. It is only natural that his first day in his new home would be interrupted by yet another nosy diplomat of the Cove. Litotes rolls his eyes to himself, eying the bay and green stallion from a distance. Clayton stands upon the border, almost as if he is hesitant to step into Pangea. 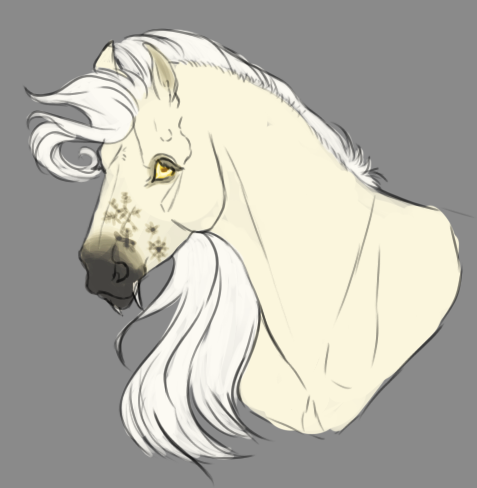 The cremello muses on why that would be, with the plague taking every land for itself now. And why would he fear a land he is to eventually rule? It can only be expected of monarchs to know their territories inside and out. A bemused smile spreads quietly across his lips. Though he questions their abilities, he is not making an outright insult to their throne. “Hi, Clayton.” The smile on his face is coy. His golden eyes trail up the large horns the boy wears like a badge - a lazy roll to the top and then down back to his eyes. “Why don’t you come in, stay a spell? I would love for you to see my new home while we work out whatever is on your mind.” He steps to the side, offering a wide view of Pangea’s twisting shadows and sharp edges. The pale stallion didn't keep Clayton too long, but as expected he was not the friendliest. He glances over Clayton like it is the first time they met, speaking as though they were childhood friends. He doesn't let it bother him, Clayton had been raised a diplomat and therefor he had better manners than Litotes did. The pale stallion had little manners, certainly hopeful that he would gain some while ruling Pangea. But he does not hold it against him, in time he will gain some of the diplomat skills. Who knows what the southern kingdom had taught him. The pale stallion offers to show him Pangea and Clayton nods his head. Yes, do show me around. He passes the border trailing deeper into the kingdom. How has your return to the east been treating you? His gaze turns to find Litotes. There was plenty left unsaid, like what are your plans with Kensa, or Dawn? Like what is with the random return to the East, wouldn't it had been simpler to talk to Clayton, Ilma and Dawn and ask to rule Pangea? But again he doesn't hold it against him, so long as his intentions are good.